Panama is attracting much media attention at the moment, and for good reason. Earlier this month we blogged on a BBC Hard Talk interview with Panama’s Vice President which referred to our comment that Panama gives “the middle finger” to the rest of the world when it comes to tackling financial crimes. The OECD’s Pascal Saint Amans has joined the fray, stating that “From the standpoint of reputation, Panama is still the only place where people still believe they can hide their money.” Until now Panama has been fairly indifferent to reputational issues, but the increased attention that Panama receives will inevitably raise concerns among the punters that Panama is no longer able to effectively protect the identity of the crooks and scammers attracted by its dodgy laws and equally dodgy law firms. 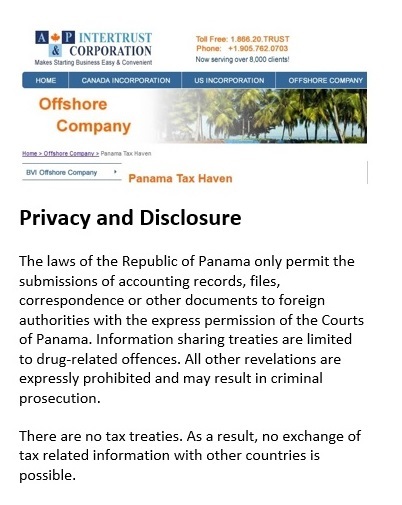 So now is a good moment to draw attention to how Panama developed as a secrecy jurisdiction and how it continues to provide full service – wash, rinse and dry – to crooks and money launderers from around the world. Panama ranks at 14th position on the 2015 Financial Secrecy Index, with a high secrecy score of 72 but a low global scale weighting due to its relatively small share of the global market for offshore financial services. The high secrecy score placed Panama within the top twenty ranking for which reason it remains a jurisdiction of particular concern. Long the recipient of drugs money from Latin America, plus ample other sources of dirty money from the U.S.A. and elsewhere, it is one of the oldest and best known tax havens in the Americas. In recent years it has adopted a hardline position as a jurisdiction that refuses to co-operate with international transparency initiatives. Panama has over 350,000 secretive International Business Companies (IBCs) registered: the third largest number in the world after Hong Kong and the BVI. Alongside incorporation of IBCs, Panama is active in forming tax-evading foundations and trusts, insurance, and boat and shipping registration. Violation of financial secrecy is punishable by prison. Panama’s offshore sector is intimately tied to the Panama canal, which (along with its strategic position between North and South America) has made it a gateway and entrepôt for international trade. There are strong similarities between Panama and other leading tax havens like Hong Kong, Singapore and Dubai. On paper at least, Panama has the largest shipping fleet in the world, greater than those of the US and China combined. This had happened as a result of a covert operation approved by the Roosevelt administration to foment an armed rebellion to wrest Panama away from the then politically fragile Colombia. Roosevelt achieved this goal with the help of William Cromwell, a well connected U.S. Republican lawyer who was legal council for JP Morgan’s railroad interests. The Administration’s key objective was to ‘liberate’ Panama for the purposes of securing rights over the Panama canal. The result was the Hay-Bunau-Varilla Treaty of November 1903, establishing permanent U.S. rights to a Panama Canal Zone several miles wide, stretching across the isthmus. Panama became independent that same month. The U.S.-backed project to build a canal through Panama, connecting the Atlantic and Pacific Oceans for trade, went ahead, and the canal opened in 1914. “Laws attracted a long line of dirtbags and dictators who used Panama to hide their stolen loot, including Ferdinand Marcos, “Baby Doc” Duvalier, and Augusto Pinochet. Most activity in Panama related to shipping, rather than offshore banking, for many years. Deposits in the banking sector began to surge, however, from almost nothing in 1970 to around US$50 billion in 1980 amid a surge in world oil prices and huge flows of Eurodollars through the offshore system (p8;) then deposits in Panama banks fell again to under $15 billion amid the Latin American debt crises and the political crises in Panama. They grew steadily after that. Yet Panama trusts and foundations, whose assets are generally not reflected in this data (see below), are likely to be equally if not more important. “Today, Panama’s financial laws remain extraordinarily lax. Foreign firms can bring unlimited amounts of money into the country without paying taxes, and an IMF report earlier this year said that of 40 recommended steps countries should take to combat money laundering and terrorism financing, Panama had fully implemented only one. In September, the New York Times reported that cronies of Russian president Vladimir Putin had funnelled money offshore through shell structures in Panama. “In one of the most remembered scenes of the film Casablanca, police chief Louis Renault orders the close of Rick’s Cafe when he is “shocked, shocked” to learn that there was gambling going on in the establishment. Seconds later a waiter presents Renault with his winnings from roulette. This was almost certainly the result of Panama courting Colombian drugs money. Of course money from Mexican drugs cartels, and from many other sources, continues to flow into this jurisdiction, with a deliberate lack of attention from Panama’s authorities, egged on by the offshore financial centre. Overall, Panama remains a jurisdiction of extreme concern for TJN, and its rank at 14th position in our 2015 Financial Secrecy Index probably understates the harmful nature of Panama’s offshore activity since a significant proportion – such as its shipping registry – is not covered by the IMF data that we use to construct our ranking. A short list of Panama’s offerings is here. Ken Rijock’s blog: Analysis and commentary on money laundering and financial crime. With endless material on Panama. Interview on Panama foundations: From an interview with an offshore provider of foundations.